Since the Facebook issues involving Cambridge Analytica and Russian Operatives have come to light, Facebook has been hard at work trying to earn back trust. The past few weeks have been busy for the company. Mark Zuckerberg testified in front of Congress, notices were sent to people like me whose data was compromised, and this week the company published what is for the secretive company a remarkably detailed set of Community Standards guidelines on what is and isn’t allowed. During this time, many people have been evaluating their relationship with the social network. I know some who have joined the #DeleteFacebook movement. I didn't go that far, but several weeks ago, I talked about how I no longer trust Facebook. The Community Standards guidelines published this week include sections on Violence and Criminal Behavior, Safety, Objectionable Content, Integrity and Authenticity, Respecting Intellectual Property, and how they handle Content-Related Requests. It’s certainly encouraging to see this transparency from Facebook. But the dark side of publishing this information is those who choose to game the system now have more to work from since these sorts of details haven't been published in the past. Policing Facebook is a daunting task. Imagine trying to make a population of over 2 billion people, more than a quarter of the world’s population, work for everyone. It’s impossible. Was your personal information used by Cambridge Analytica? Mine was. Last week Facebook came clean with people directly affected by the misuse of personal information by Cambridge Analytica. 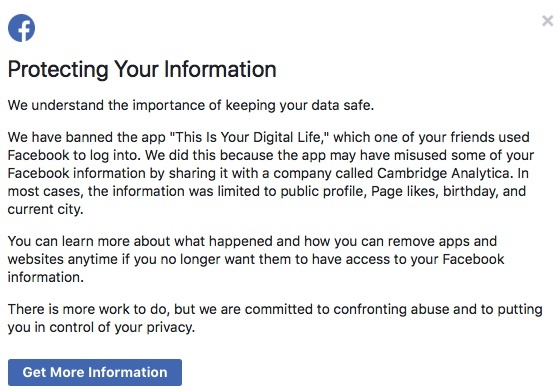 On the top of my Facebook newsfeed was a message “Protecting Your Information” with the fun fact that an app somebody shared with me called "This Is Your Digital Life" was one of the Trojan Horse apps to get personal data and my stuff was compromised. The notice concluded with “There is much work to do, but we are committed to confronting abuse and to putting you in control of your privacy." The notice linked to a page on Facebook titled How can I tell if my info was shared with Cambridge Analytica? It’s essential that Facebook sort out these issues because I fear what will happen if Congress decides to take action. They might break the company up like they did with AT&T decades ago or slap controls on how we communicate with the service. 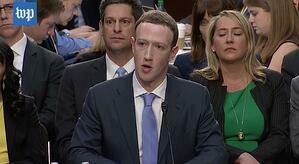 When Facebook founder and CEO Mark Zuckerberg was hauled in front of Congress to testify about these issues, he did an excellent job explaining the situation to the mostly clueless members of Congress. The entire transcript is available from the Washington Post together with a three-minute highlight video that's worth watching if you missed the testimony. I still don't trust Facebook. But if the company keeps working as they have, I could be persuaded to change my mind.